Kali Orexi presents a double delight – two ‘video-recipes and interviews’ created for the Ithacan Philanthropic Society (IPS) Centenary Exhibition at the Immigration Museum, Melbourne – running from 19 November 2016 until 4 June 2017. 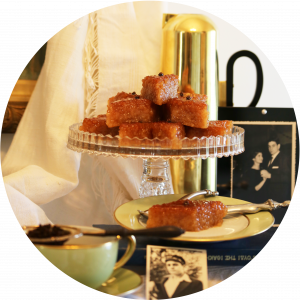 The first video-recipe, presented by Peter Paxinos, is of the highly-revered Ithacan sweet – Rizo-Rovani. This recipe requires time and patience – but if you have both, then you will be amply rewarded by the heady aroma and flavour of the spices; the toffee-like crust; and the gelatinous balls of rice in the body of the slice – all of which make it a sensational sweet to eat. This recipe comes with a warning, though – it’s impossible to have just one slice. If you don’t believe us, just make it and try resisting! Immediately following the recipe, Peter shares his intriguing Ithacan-Australian journey – a story not to be missed. 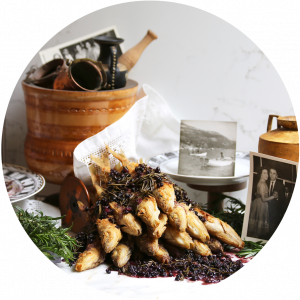 The second video-recipe, presented by Maria Dellas, is Savoro – a unique Ithacan fish dish of fried silver-whiting dressed with a blackcurrant, rosemary, garlic and malt vinegar sauce – a texture and flavour combination that is truly drool-worthy! Fish have always been a staple of the Ithacan diet. In years past, without refrigeration, fish caught at sea would need to be cooked and preserved. The vinegar in this dressing helped to preserve the fish, allowing the islanders to eat them over a number of days. We weren’t able to verify this fact, as the KO Film Crew devoured this delicious dish the moment filming was done! Immediately following the recipe, Maria shares her Ithacan-Australian journey in a very engaging interview. Kali Orexi would like to thank the IPS for the honour and the privilege of working with both Peter Paxinos and Maria Dellas in preparing these two videos. The experience has reinforced the fact that although the creative process of producing beautiful, didactic videos and capturing captivating photographic images is very rewarding, as is the opportunity to teach these recipes to a broad and receptive audience, the most fulfilling and enriching part of this work is engaging with warm, charismatic and generous guests like Peter and Maria; and engaged, dynamic facilitators/collaborators like IPS members – Anna Vlass and Debbie Argyropoulos.